What does it mean for an organism to be ‘rare’ in a habitat? In simple terms, it means that you can find and count far fewer of them relative to other, more prevalent, comparable organisms. Rarity is relative. But what if the ‘rare’ organisms are really ‘common’ and you just aren’t doing a good job of locating them? Maybe the ‘normal’ way of looking for them isn’t effective. Your ability to find things can be very much a function of how you look for them, and fluorescence can provide a new and improved way to find many organisms. This potential for a ‘new’ search technique to dramatically enhance the ability to find organisms and thus upend assessments of rarity was brought home by a recent publication on cryptic marine species (De Brauwer et al., 2017; article on this web site). Cryptic, or highly camouflaged, animals are by nature difficult to find. They blend in with their environments, sometimes to remarkable degrees. This poses a challenge when trying to estimate population sizes, home ranges, and other biologically and ecologically important parameters. De Brauwer and his colleagues found that of 95 different varieties of cryptic fish, 83 (87%) were fluorescent and were much easier to find (and count!) as a result. They reported finding triple the number of some of the cryptic fish surveyed using fluorescence vs traditional methods. In addition, the probability of species displaying fluorescence was much higher for cryptic than non-cryptic species – an intriguing and as yet unexplained observation. So if cryptic fish become easier to find and your estimate of population size changes as a result, are they still rare? The De Brauwer paper did not come to a conclusion on the question of rarity, but we know of a case in which fluorescence radically changed population estimates for a nudibranch. Nudibranchs, also commonly called sea slugs, are shell-less gastropods that can be found in all the world’s oceans, are highly varied, and can be very strikingly colored. They can also be very small. Alicia Hermosillo, who researched nudibranchs in Mexico, discovered and described a new species, Cuthona (now Tenillia) millenae Hermosillo & Valdés, 2007 at Islas Revillagigedo. The animals are only about 5mm (0.2 inch) long. Here is how she describes her observations in a post on the Sea Slug Forum, and how it took just one night dive using fluorescence as a search tool to change a species assessment from ‘rare’ to ‘common’. Rarity is an important concept in conservation biology. Among species that are ecologically similar, those that are rare are much more likely to become extinct. Rare species can play important ecological roles within their respective environments, and contribute to greater overall biodiversity. So it is worthwhile trying to understand and protect rare species, and along with that it would be good to know if they are in fact rare. Rare is relative, and is fundamentally tied to our ability to locate that which we wish to count. New ways of looking can enhance that ability and result in new assessments of population numbers. 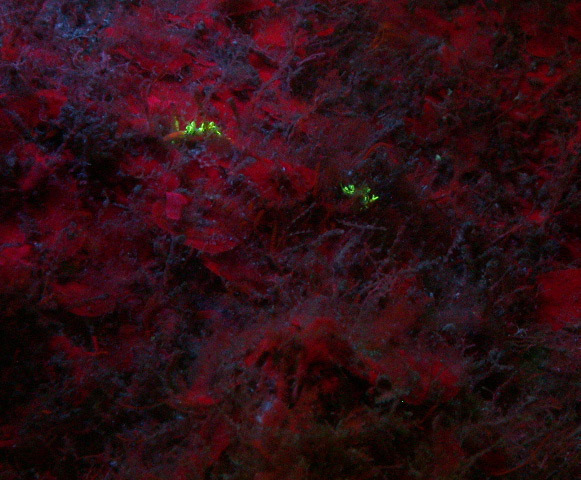 Fluorescence is a powerful technique that is proving valuable for locating hard-to-find organisms in both marine and above-water environments. As defined by Reveal (1981) “rarity is merely the current status of an extant organism which…is restricted either in numbers or area to a level that is demonstrably less than the majority of other organisms of comparable taxonomic entities.” In other words – rarity is relative. Flather, C. H., & Sieg, C. H. (2007). Species rarity: definition, causes and classification. Conservation of rare or little-known species: Biological, social, and economic considerations, 40-66. Hermosillo A. & Valdés, A. (2007). Five new species of Aeolid nudibranchs (Mollusca, Opisthobranchia) from the Tropical Eastern Pacific. American Malacological Bulletin, 22: 119-137. Reveal, J. L. (1981). The concepts of rarity and population threats in plant communities. Pp. 41-46 in Rare Plant Conservation: Geographical Data Organization, ed. L. E. Morse and M. S. Henefin, Bronx: New York Botanical Garden. 377 pp.